Zion National Park is one of the smaller national parks in the United States of America. Covering just 593.3 km², Zion National Park is a must-visit destination for travelers heading to Utah. Best known for its steep and jagged red rock cliffs and its arid landscape, Zion National Park is an adventure playground for avid explorers. From hiking trails to rock climbing, from mountain biking to bouldering, there is a heap of fun to be had in Utah’s favorite national park. One of the most iconic spots in Zion National Park is the Emerald Pools. No trip to the park would be complete without taking a moment, or more, to marvel at the glistening pools. The waterfalls and fast flowing rivers of Zion National Park serve to add a great sense of magnificence to an already mesmerizing environment. There are a number of excellent places to stay in and around Zion National Park. Some destinations are ideal for adventurous, rough and ready travelers, while others cater to those who prefer something more luxurious. Camping is a popular option in Zion National Park and the area is not short of glamping opportunities either. Let’s explore where to stay in Zion National Park. Springdale is the most populated place to stay in Zion National Park. As the gateway to the national park, Springdale sees almost every single visitor who passes through. Although there are less than 1000 permanent residents, the town is well prepared for tourists. In fact, it would be safe to assume that during the high season there would be more tourists residing in Springdale than permanent residents. Springdale is surrounded by Zion National Park. To the north-west, the town is overlooked by Mount Kinesava and The West Temple. To the south-east, Springdale is guarded by The Watchman and Johnson Mountain. 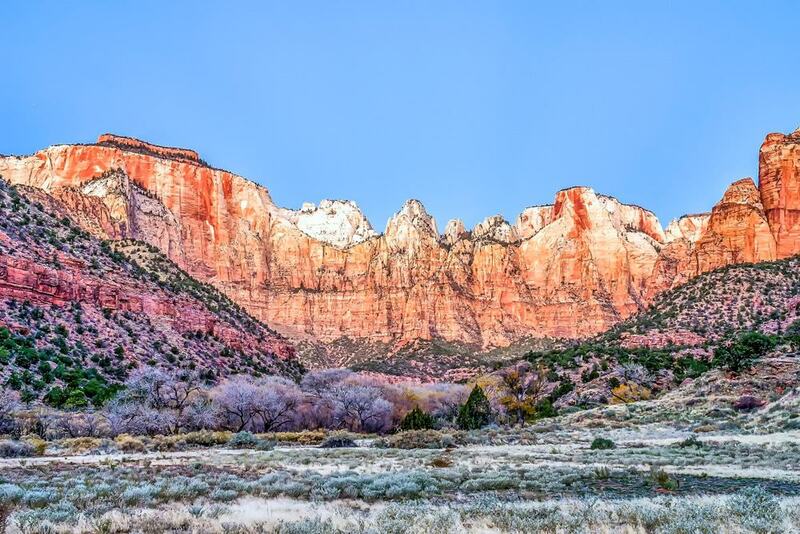 The center of Springdale town is just a 3-minute drive from the Zion National Park South Entrance Ranger Station. Travelers could not stay closer to the wilderness if they tried. There are lots of camping grounds in and around Springdale, all of which offer incredible views of the mountains. Many of the premium hotels also offer rooms with landscape views. SpringHill Suites by Marriott Springdale Zion National Park – SpringHill Suites by Marriott Springdale is a modern hotel in Springdale with a real sense of class. The rooms have an urban feel but the views from the bedroom windows offer stunning vistas of Zion National Park. The staff are wonderfully accommodating and will help in any way that they can. Flanigan’s Inn – Flanigan’s Inn is a modern hotel in Springdale that offers great value for money. Flanigan’s Inn has been awarded 3 stars and constantly upholds its own high standards. There is a work desk in every room and a flat-screen TV with cable channels. There is free parking. Driftwood Lodge – Zion National Park – Springdale – Driftwood Lodge is a top pick hotel with a fantastic set of facilities. There is an outdoor swimming pool with a sunbathing terrace. The rooms are warm and homely and offer high levels of comfort. There are a bar and restaurant in-house that are open daily. Straddling the Utah-Arizona border is the city of Hildale. A tiny city but a city indeed, Hildale is home to just under 3,000 people. Hildale and neighboring Colorado City would be considered one and the same to the untrained eye and the two are very similar. Hildale is an endearing place to explore. It is the kind of place where like-a-local travelers will feel right at home. Unlike Springdale, which caters almost exclusively to the needs of tourists, Hildale merely offers a few hotels and a welcoming smile. Hildale is an hour’s drive from Zion National Park South Entrance Ranger Station. In the high season when Springdale’s prices spike and the hotels get booked out, Hildale is a great option to keep up one’s sleeve. For travelers looking to meet and mingle with locals in Hildale, there is just one place to go. The Edge Of The World Brewery & Pub is the most popular watering hole in town and falls on the Colorado City side of the border. Zion Glamping Adventures – Zion Glamping Adventures is a fantastic place to stay, just outside of Hildale. Zion Glamping Adventures offer travelers the chance to sleep under the stars in complete comfort. The luxury canvas tents all have real beds and warming heaters. There is a barbecue area with picnic tables for guests to have their own feast. Zion Luxury Camping – Zion Luxury Camping is a good accommodation option in Hildale. Each luxury camping tent can sleep up to two people and there is more than enough space for both. The bathroom blocks are shared and are kept immaculately clean at all times. Mountain views are guaranteed and there are barbecue facilities available. Zion Suites of Hildale – Zion Suites of Hildale is a top pick in Hildale. The hotel offers guests the opportunity to relax and unwind in the shared lounge, or chill out on the barbecue terrace. All rooms come with tea and coffee making facilities. An American style breakfast is included in the room rate. The city of Hurricane sits within Washington County, in the state of Utah. Hurricane actually borders the Red Cliffs National Conservation Area and is just a 23-minute drive from the bustling city of St George. 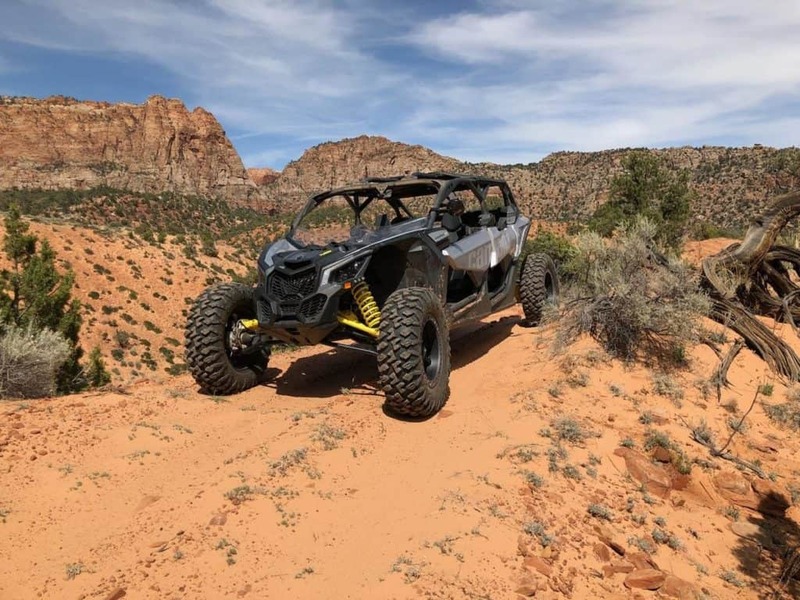 Hurricane is a fantastic place to stay as it offers travelers the chance to experience both Red Cliffs National Conservation Area and the incredible Zion National Park with complete ease. For travelers seeking to maximize their time in the wilderness of Utah, Hurricane is the best place to stay. After all, it is equidistant between Utah’s best-preserved landscapes. Other natural gems that are not to be missed during a visit to Hurricane are Quail Creek State Park and Sand Hollow State Park. The latter offers off-highway driving routes ideal for adventurous 4X4 drivers. Sand Hollow State Park offers a natural playground for all the family to enjoy. Taking a dip in the reservoir is a highly recommended way to cool off in the summer months. Zion Village Townhome – Zion Village Townhome is perfect for traveling families or those looking to stay a little longer in Hurrican. Zion Village Townhome offers travelers the chance to be self-sufficient. There is a fully equipped kitchen, a living room and three bedrooms to enjoy. There is both free WiFi and parking. Hurricane Windgate at Zion – Hurricane Windgate at Zion is a smart hotel on West State Street. The rooms are homely and offer all the amenities travelers could ask for. Each room has an ensuite bathroom and a walk-in shower unit. There is an outdoor swimming pool and guests are welcome to relax and unwind on the sun terrace. Econo Lodge Hurricane – Zion National Park – Econo Lodge Hurricane is a popular and super affordable hotel in Hurricane. Econo Lodge Hurricane offers great value for money. The complimentary continental breakfast is included in every room rate, as is access to free WiFi and free parking for guests. There are an outdoor swimming pool and sun terrace. 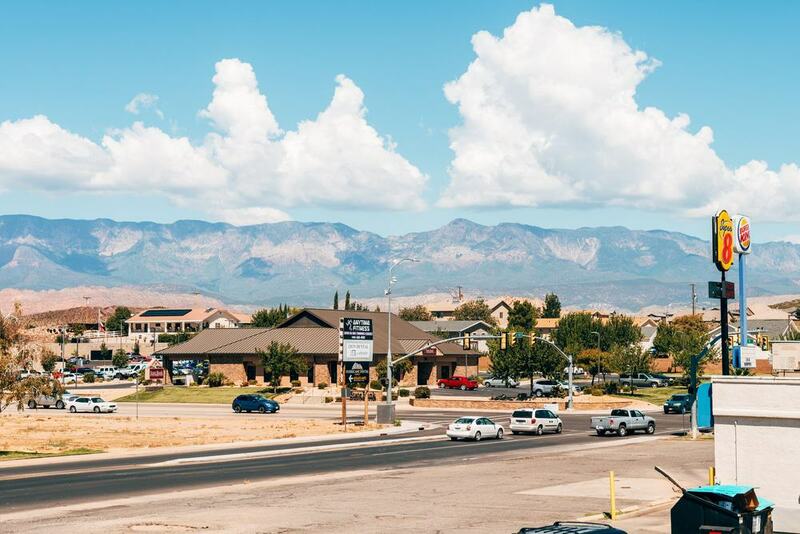 The buzzing and bustling city of St George is the perfect place to stay for city slickers who like the idea of exploring Zion National Park but do not want to stray too far away from their home comforts. Offering easy access to Zion National Park and the picturesque Red Cliffs National Conservation Area, St George is a real winner. The scenic Snow Canyon State Park is only a 20-minute drive from the center of the city. For families traveling to Zion National Park, St George would be a good option. There is plenty to keep the children happy and there are plenty of dining options too. One Hot Grill is a very popular hamburger joint on Tabernacle Street. One of the most popular activities in St George is St. George Dinosaur Discovery Site at Johnson Farm. The educational park features fossilized plant life and fish. There are prehistoric dinosaur tracks to follow and plenty of other interactive exhibits. The center opens at 10 am daily. La Quinta Inn & Suites Saint George – La Quinta Inn & Suites Saint George is an affordable accommodation option set in a great location in St George. La Quinta Inn & Suites offers a year-round outdoor swimming pool and a hot tub. There is a very good breakfast included in every room rate, offering further value for money. Inn On The Cliff – Inn On The Cliff is a popular option in St George. There is a rustic feel to the rooms and there are homely touches like a seating area and tea and coffee making facilities. All rooms have a private balcony and a 50-inch flat-screen TV with cable channels. Seven Wives Inn – Seven Wives Inn is a super hotel in St George. With family rooms available, Seven Wives Inn is a top pick for young families heading to the city. The complimentary continental breakfast at Seven Wives Inn is considered to be one of the best in St George and is not to be missed. Cedar City can be found to the north of Zion National Park and to the west of Dixie National Forest. Much like Hurricane, Cedar City offers travelers an incredible opportunity to stay close to some of North America’s best-preserved wilderness areas. 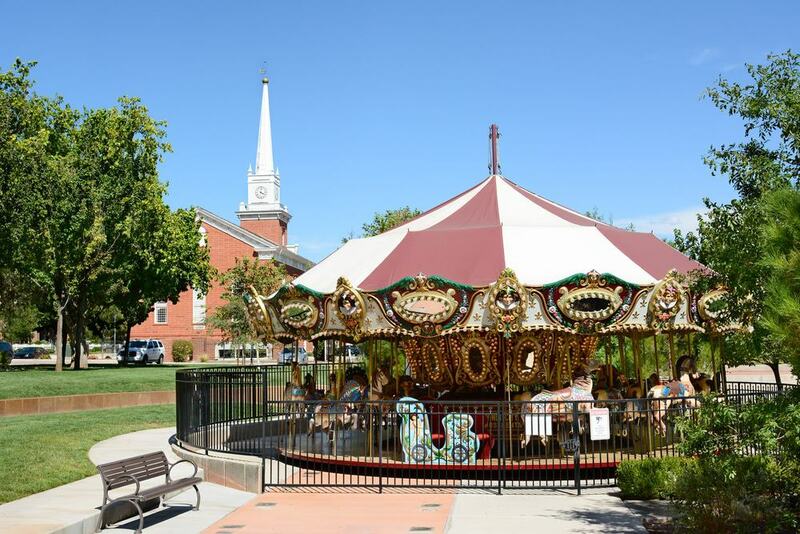 Although it is not possible to visit both Dixie National Forest and Zion National Park in one day, Cedar City offers travelers an ideal location to use as a base. Additionally, the beautiful Red Cliffs National Conservation Area is just a 50-minute drive away. Cedar City is something of a hidden gem when it comes to where to stay in Zion National Park. Cedar Ridge Golf Course is one of the major draw cards to Cedar City. The 18-hole course is open every day of the week and rental clubs are available. There is even a driving range, putting green, and chipping green for those who want to get some practice in before heading to the main course. 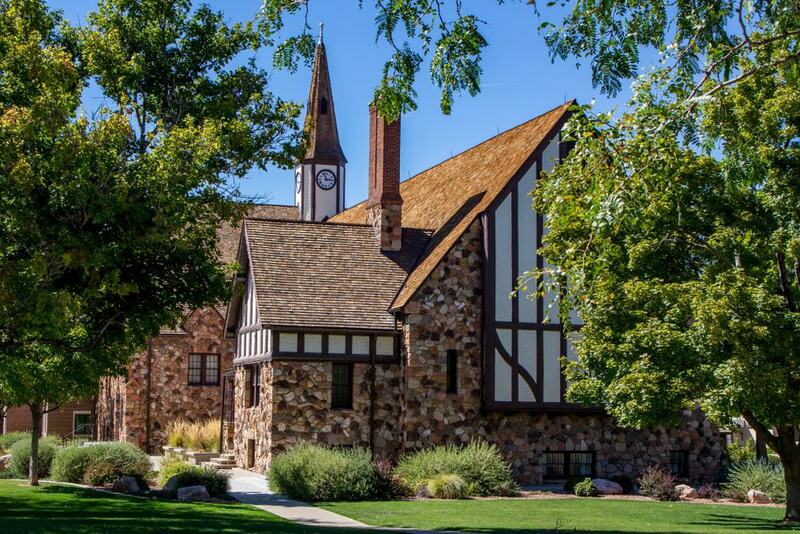 Big Yellow Inn – Big Yellow Inn is an exceptional hotel in Cedar City. Set within a grand house, the bed and breakfast is run by a local family. There are eight fireplaces throughout Big Yellow Inn and guests never go cold, or hungry. The breakfast spread is impressive and is included in every room rate. Amid Summer’s Inn Bed & Breakfast – Amid Summer’s Inn Bed & Breakfast, is a bestselling hotel in Cedar City. There is an exceptional breakfast included in the room rate and it is served in continental, buffet and à la carte styles for guests to choose as they like. There is free WiFi and free parking is available. The B&B is family friendly. El Rey Inn & Suites – El Rey Inn & Suites is an excellent choice for travelers heading to Cedar City. There is a TV in every room with cable channels. Guests will find a microwave, small fridge, and coffee-making facilities in their room too. There are family suites available, sleeping up to six people.